IT won’t take long before the Philippine Basketball Association (PBA) will name the man who’s going to succeed commissioner Chito Salud. Chairman Patrick Gregorio said the league board hopes to come up with a replacement not later than the end of the ongoing Commissioner’s Cup. Gregorio disclosed representatives from all the 12 member teams will have a meeting on February 26 to set the criteria that will determine the next leader of Asia’s first ever play-for-pay league. And it won’t be long before the board decides on who is going to assume the position to be vacated by Salud. 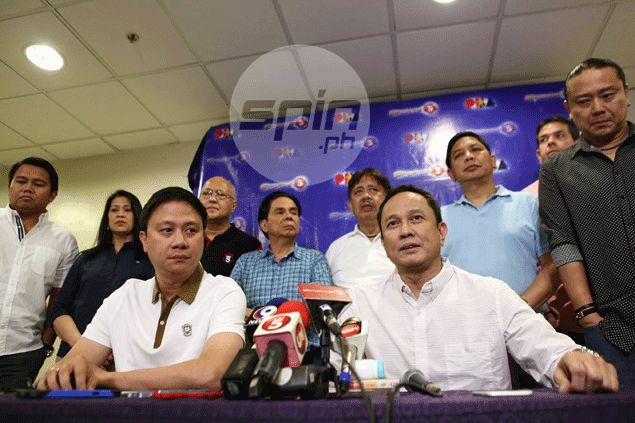 “Ito pong prosesong ito ay mangyayari at hindi lalagpas ng end of the second conference,” said the chairman, who sat beside Salud during the press conference announcing his decision to step down from his post on Sunday at the Mall of Asia Arena. The fast-tracking of the selection process, according to Gregorio, should give the next man at the helm a smooth transition to the commissionership. “Para may sapat na oras tayo na mag turn over kay Commissioner Salud,” said Gregorio, adding the ‘incoming commissioner’ will at least have the season-ending conference to acclimatize himself to the position with the help of Salud himself. Asked if he’ll endorse someone to succeed him, Salud said he believes a lot of personalities are qualified for the job. “I’m sure names will come out. Maraming pangalan ang lalabas and many out there are capable,” he stressed. “But it ought to be a consensus. The team owners should come together to choose the next commissioner with the help of their governors,” Salud said. One thing for sure, the next commissioner will have big shoes to fill, said Gregorio. “Napakabigat po dahil kitang-kita naman natin ang performance ni commissioner Salud for the past five years,” said the league chairman.